Apologies straight away for that awful pun, but as it's Halloween, I thought I'd present a Boo Cook special! Boo is a fantastic artist who's off the wall imagination and amazingly vibrant colours are always guaranteed to absolutely blow me away! 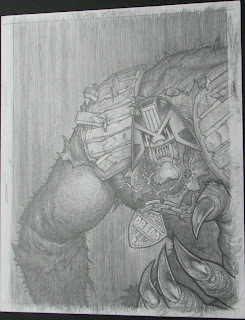 As with most 2000AD artists, Boo earned his stripes illustrating the obligatory Tharg's Future Shocks, getting his first one under his belt in August of 2000. 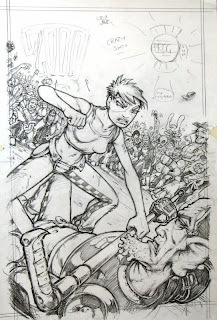 After impressing the fan base with his imaginative layouts and exotic aliens, he was given a three part ABC Warriors strip before teaming up with writer Rob Williams to produce the political strip Asylum. 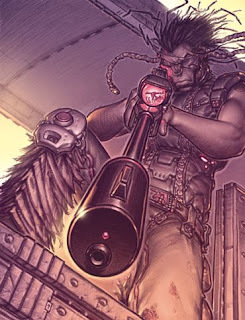 The tale followed Marshall Holt, an alien hunter who's job it was to track down illegal immigrants trying to enter Earth. Holt was stationed on a lunar platform tethered to Earth, where any alien refugees would be processed before being granted entry to the planet. 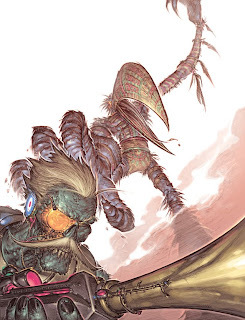 As with many of his Future Shocks, this gave Boo a chance to cut loose and showcase some of his sublime future tech and his balmy alien designs. 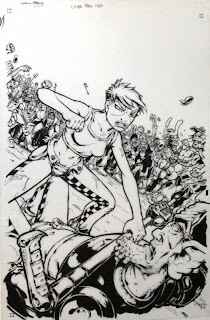 The strip was a success, spawning an enjoyable sequel as well as being collected in a graphic novel. 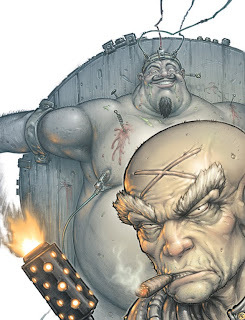 Among its many merits, the strip is notable for going down in 2000AD history as the first to depict a badly wounded man of the cloth shitting himself. Though as we will see, this was not Boo's last association with faeces in the Galaxy's Greatest! Following Asylum, Boo worked with former Tharg Dave Bishop on the prison story Dead Men Walking. Reaction to the strip was mixed, but once again, an intergalactic prison full of exotic aliens and zombies allowed Boo's fertile imagination to soar! Below we can see covers for both strips as well as prog 1411's Lobster Random cover. 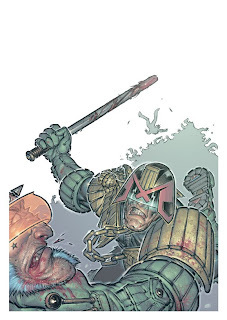 Boo got his first shot at illustrating Judge Dredd in Prog 1432, in the Undercity tale Descent. 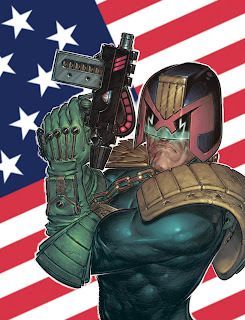 Written by Gordon Rennie, the story saw Dredd, Psi-Judge Karyn and two other judges venture into the dangerous Undercity beneath Mega-City One to rescue a group of tourists from some hungry troggies. 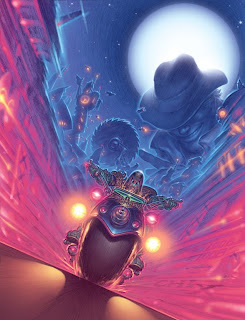 The trail leads them to a powerful psychic troggie known as The Shadow King, who resides in the ruins of St. Patrick's Cathederal in Old New York. Boo's colour palette of oranges and purples used in this strip is absolutely wonderful, the pages actually seem to glow! The story is a significant one in the world of Dredd as it sadly sees the (apparent) end of long running Psi-judge Karyn as she sacrifices her humanity to save Dredd, becoming a feral beast possessed by the demonic spirit of the Shadow King. 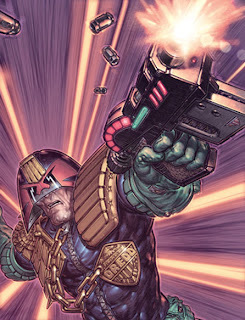 Below we have Dredd-flavoured covers for Progs 1422, 1436 and 1471. 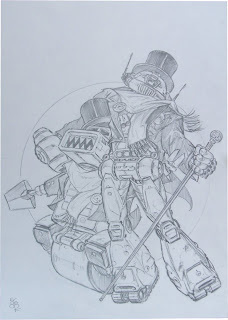 Boo's next co-creation for 2000AD was the popular Harry Kipling (Deceased), created with the wonderful Simon Spurrier. 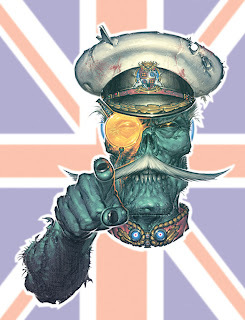 Kipling is an Earl Grey drinking, elephant gun toting, stiff upper lipped, British Imperial Zombie who's job it is to hunt and kill deities, all in the name of the British Empire. 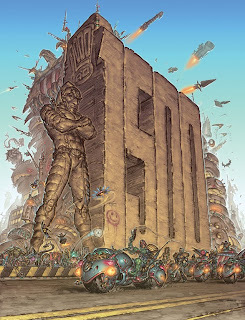 Below we see the prestigious cover for Prog 1500. 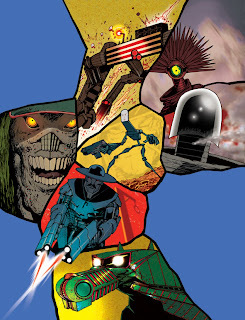 The cover features a host of characters and vehicles from 2000AD's rich history including Tharg the Mighty, Dredd, Guthrie, Jonny Alpha, Wulf Sternhammer, Chopper, Zenith, the ABC Warriors, Two tonne Tony Tubbs, Spikes Harvey Rotten and many many more. 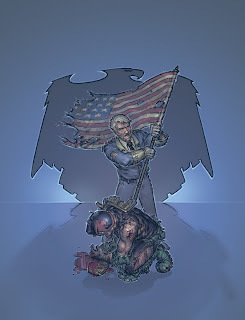 Finally, for 2000AD at least, there's the cover of Prog 1532, showing Dredd at the mercy of the last president of the USA, Big Bad Bob Booth during the Origins storyline. 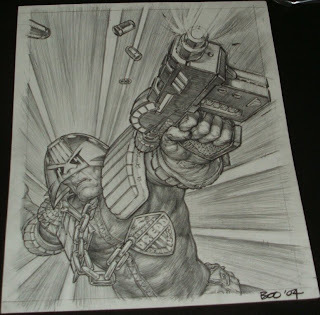 As well as working in 2000AD, Boo has had several covers and strips published in the Judge Dredd Megazine. Returning to the poop theme, Boo's first story for the Meg was "In the Stomm" in Megazine 236 which saw him battling a huge rat-squid in a stinking sewer beneath Lon Chaney Block during a crime sweep. 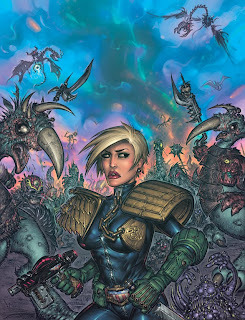 Currently, Boo is lead artist on the Judge Anderson strip, giving us the extraordinary Wiierd and Biophyle strips penned by Alan Grant as well as next years' House of Vyle. Below are the superb covers of Megs 254 and 274 respectively. 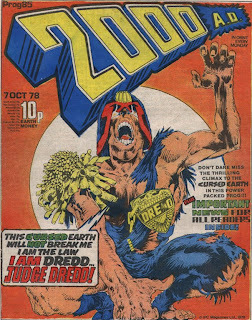 Next up we have the wonderful cover of Zarjaz fanzine's 30 Years of Dredd Special. Is that Lobster Random's claw I can see there? 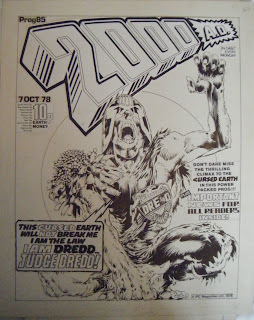 Boo also provided covers for several 2000AD Extreme Editions. Obviously, his crackpot imagination and superb alien designs made him a natural choice to provide a cover for a reprint of the late Massimo Belardinelli's strip, The Dead, and he was also chosen to illustrate Ro-Jaws and Hammerstein for Extreme Edition 24. 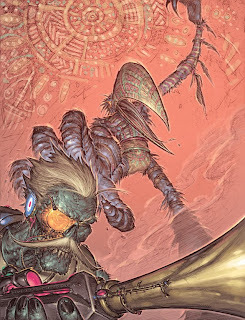 Currently, Boo's beautiful artwork can be seen in the fantastic Elephantmen published by Image comics as well as on his superb blog All Tomorrow's Particles, which I recommend to find at http://www.boocook.blogspot.com/, some of his Elephantmen covers are simply breathtaking! Many, many thanks to Boo for sending me so many covers, I can't wait to see him back in the Meg next year! Henry Flint - "I am Skakara!" 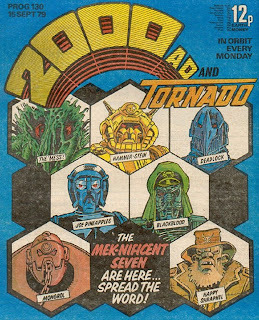 Among the many, many artists who have worked for 2000AD I can think of few who are as universally popular (or indeed as talented) as Mr Henry Flint. Known for his amazing creativity, bonkers imagination and staggering attention to detail, Henry has baffled and thrilled us in equal measure for fifteen wonderful years! Henry's artwork has a wonderful old school feel that is mixed with a sense of the very best cutting edge design. 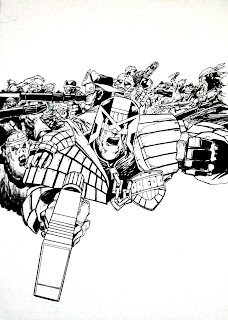 The best way I can think of describing his work is, it's like someone took all the best bits of McMahon, Bolland, O'Neill, Gibson, Bisley, Robinson, Dillon, D'Israeli and Langley, mixed 'em together, added some concentrated creativity and ramped the Thrillpower up to maximum! 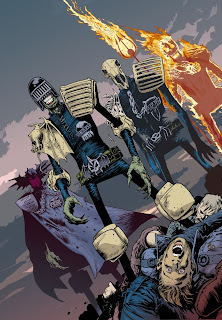 Above we see his fantastic homage to McMahon's seminal Cursed Earth cover of Prog 85, a fan favourite to many, many readers. In typically modest style, Henry said that Tharg "asked me to use the same pose as Prog 85, it was his idea and a good one too. I don't usually sign my work but I did with this one only so I could add McMahon's initials. It isn't that clear instead of putting 'after' I put a 'wink' !) anyway, those in the know will hopefully understand. It's always best to credit a pose (specially when you know you won't get away with it!!!)" 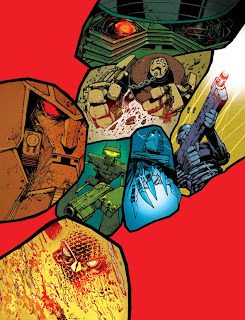 I'm sure McMahon will be flattered to see such an amazing cover from an artist who really is at the top of his game. 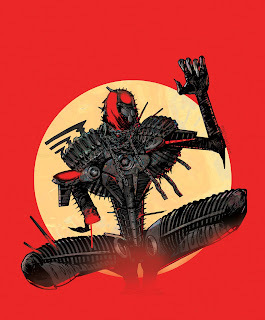 This cover reminded me of a set of variant covers Henry did for the ABC Warriors story 'Shadow Warriors' in prog 1476. I asked Henry about the design of these as there was something vaguely familliar about them. 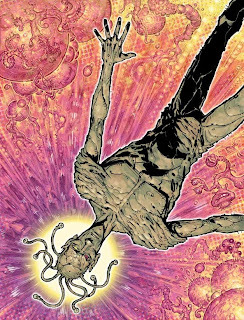 He said "Prog 1476 was my own design but it was directly influenced by Prog 130. I think I was asked for a group shot of the ABC's in action but I thought it would be interesting to have a cover in segments...like those 80's annual covers." 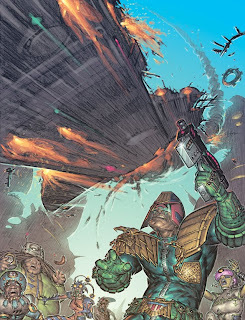 As well as Shakara, Henry is best known for his fantastic artwork on this year's hit strip Zombo (which he co-created), Nemesis, Deadlock, ABC Warriors and a host of Judge Dredd hits including the superb Dredd vs. Aliens crossover Incubus. Once again, thanks to Henry for being so generous with his time and for the years of fantastic thrillpower he has given us all! 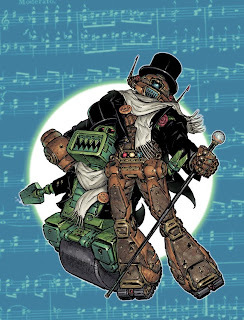 New Zarjaz and Dogbreath Covers! Those talented guys at Futurequake Press have done it again! 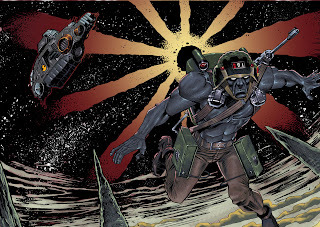 Last week saw the release of the wonderful eighth issue of Zarjaz featuring a stunning PJ (Nicest Man in Comics) Holden Rogue Trooper cover which has been superbly coloured by Steve Denton. Last week also saw the release of Issue 21 of the Strontium Dog fanzine Dogbreath which boasts an amazingly rendered cover by Paul Rose. I urge all readers to rush out and buy both fanzines. They're absolutely superb, with artwork and scripts by some of tomorrows brightest stars! Go to http://thequaequamblog.blogspot.com/ and snap 'em up! Thanks to Bolt for sending them!